Identification: Tiny. 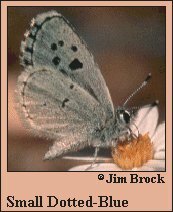 Upperside of male pale lavender-blue with a narrow dark border; female is all brown. Underside white with large spots on forewing, small spots on hindwing. Life History: Males patrol during the day to search for females. Eggs are laid singly on membranous sheaths beneath the flowers. Caterpillars eat Eriogonum flowers and the fleshy growths at the joints of Oxytheca. Chrysalids hibernate. Caterpillar Hosts: Oxytheca and Eriogonum species in the buckwheat family (Polygonaceae). Adult Food: Flower nectar, usually that of the caterpillar hosts. Habitat: Deserts, edges of dry desert lakes, stream edges in foothills. Range: Local and uncommon. Western Nevada, eastern and southeastern California. Conservation: Populations outside of the Mojave Desert region should be conserved, especially in the Sierra Nevada foothills (subspecies bohartorum). Management Needs: Determine effects of exotic plants and fire on extant populations.